Ovenden West Riding gave their worst display of the season but still ran out 5-1 victors against Tingley Athletic at West Vale on Saturday. 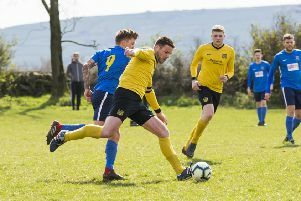 Not for the first time this season the West Riding County Amateur League Division One leaders were indebted to John Booth, whose hat-trick gave them a flattering 3-1 interval lead. Tingley were much improved from the earlier meeting and the ever dangerous Scott Austin gave the likes of Jamie Randall and Jordan Wadsworth a uncomfortable afternoon. His trickery, along with Charlie Holt’s height, became a constant worry for the home side. Booth put West Riding one up on 15 minutes, very much against the run of play, when he finished in typical style from 10 yards. Tingley kept Lewis Scott in the West Riding goal busy until Booth took advantage of an horrendous defensive mistake to double his side’s lead. Booth soon completed his hat-trick from eight yards after good build up play involving Terry Ryan and Hayden Kerris. On the stroke of half-time Tingley deservedly pulled one back when Austin headed home from two yards. West Riding improved only slightly after the interval, Damien Randall finishing off some better build up play on 65 minutes. Andy Bailey scored from the penalty spot after Booth had been brought down on 80 minutes to complete the scoring in a game that West Riding will want to forget. Brighouse Old Boys’ difficult season in the West Yorkshire League continued with a 7-3 defeat away to Leeds Modernians. They looked the better side in patches but the lack of their regular keeper and poor marking cost them dearly. Brighouse were two down in five minutes, a plethora of chances coming Modernians’ way. A free shot and a free header from a corner put the home side in control. Brighouse got up and running with lone striker Craig Billingham at the apex of their efforts. The impressive new signing’s ability to hold on to the ball plus his physicality was causing Modernians problems. He won a penalty and expertly put it away to the right of the keeper. Saxon Hargreaves, Matt Airey, Peter Kuleczko and Jordan Hadden made inroads but chances were missed and a breakaway just before half-time allowed Mods to increase their lead. Two early goals by the Leeds side at the start of the second half rocked Old Boys, who sent on evergreen talisman Glen Lee, to galvanise the midfield. Kuleczko set up Hargreaves to dribble past the keeper and score. Brighouse flooded forward but they left gaps for Mods, who moved further clear before Old Boys had the last word through Martin Newham after Kuleczko’s shot had rebounded off the keeper. Old Boys, who are four points adrift at the foot of Division One, travel to title contenders Rawdon Old Boys on Saturday.